My close friend Hilary and I both have ties to the wine world. Her family makes Johansing wine and one of my best friends, Joe Kidd is the GM for Treasury Estates. Between the two of us we are well-connected and have a blast wine tasting every time we are in Paso Robles. Her family also happens to have a beautiful ranch where she has planted lavender fields. You can check them out at Johansing Vinyards. Last time we were in Paso, after a wonderful day of wine tasting and a delightful dinner we started a bonfire. Then broke out the Tanquerey and sipped on this cocktail. It just so happens Tim McGraw sings about Tanqueray in a song called “Hey Now”. As it was playing in the background we were singing along, “ready to dance, sing, and do just about anything”. 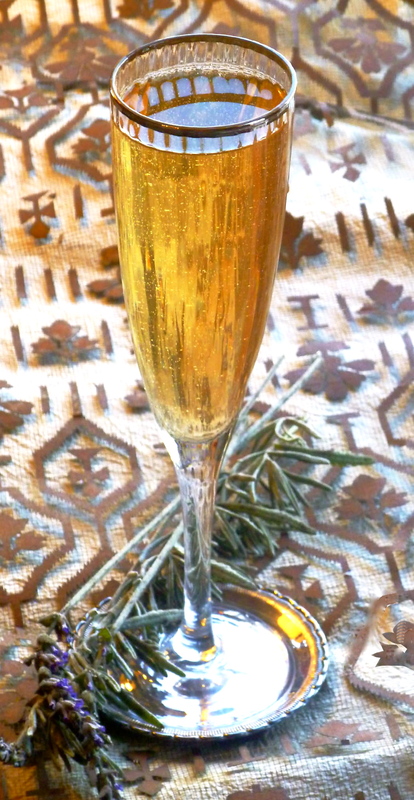 Pour lavender vermouth into a champagne flute and swirl it around so it coats most of the glass. Add Dimmi, Tanqueray, lemon, bitters and stir. Top with Laetitia Brut Cuvée. Put one half cup dried organic lavender buds into a 750 ml bottle of Dolin De Chambery Dry vermouth. Shake well. Let sit for an hour. Fine strain lavender out and vermouth into another airtight container. * To Get the full Tim McGraw experience click here. ** To make a very refreshing glass of lemonade, add one or two ounces of lavender vermouth.